20 banana leaves or corn husks. In the video, peanuts are mixed with soy protein for the filling. You can use vegetables such as corn, zucchini, red peppers, or mix seitan with some spices! To make your own masa, purchase masa harina on-line or at your favorite Mexican grocery. Mix about 4 cups of the masa harina with water until you get the consistency of thick pancake batter. DO NOT ADD the additional water called for in the recipe. 1. Mix the all the ingredients to make the masa. 3. Place about 1/2 cup of the masa onto the banana leaf. 4. Add a spoonful of filling. 5. Bring the corners of the banana leaf up and fold forwards and then backwards to seal the pocket. 6. Fold again in thirds and place in a steamer basket that has some added banana leaves to help with uniform cooking with the steam. 7. Place all the tamales in the steamer basket. 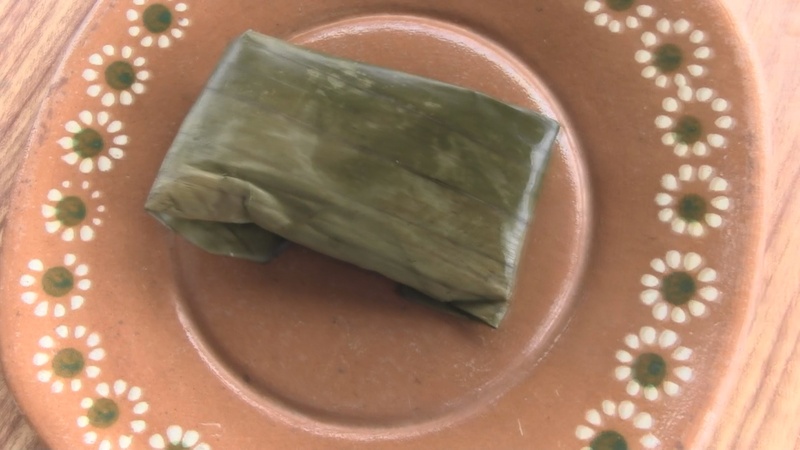 Banana leaves are more traditional but you can use corn husks if you do not have banana leaves. They each taste different. Thanks to Perla Moreno for her help in making this video!